Gold Sheen Sapphire colours range from gold, brass and copper tones. The gem is excellent in low light, often displaying flashes of gold and copper. In strong white light or direct sunlight, fascinating geometric patterns become most apparent. All cabochon cut Gold Sheen Sapphire displays asterism to some degree, most from weak to medium six arm star. Gold Sheen Sapphire will often display an ‘aurora’ effect, so named because the light emitted from the gem emulates the Aurora Borealis. Some rare Gold Sheen Sapphire also display a vivid blue colour, while even rarer are pink-bronze, greens, and most rarely reds and purples. View examples of Gold Sheen Sapphire colour here. Gold Sheen Sapphire was discovered from a mine in Kenya in 2009. This is the single known source of Gold Sheen Sapphire in the world. 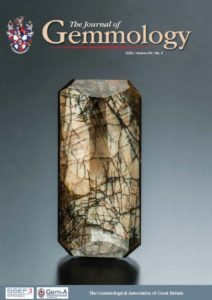 It has taken several years to develop the cutting techniques to display the gemstone to the best effect. Cutting an polishing is done at the cutting factory in Bangkok, Thailand. Gold Sheen Sapphire was discovered by Mr Tanzim Khan of Genuine Gems and Jewellery. Mr Khan has 25 years experience in the gem industry and is a respected gem cutter and trader of rough and cut stones in Bangkok. Genuine Gems and Jewellery own the cutting factory and developed the cutting techniques for Gold Sheen Sapphire. Gold Sheen Sapphire and Golden Sheen Sapphire are interchangeable. The name ‘Golden Sheen Sapphire™’ has been trademarked by Genuine Gems and Jewellery to trademark both the gemstone and cutting process of Gold Sheen Sapphire. WHY BUY GOLD SHEEN SAPPHIRE?